These shirts are 100% light-weight cotton. They are super comfortable and a great addition to any renaissance festival costume or period piece. They are cool, comfortable and great for the hot months. 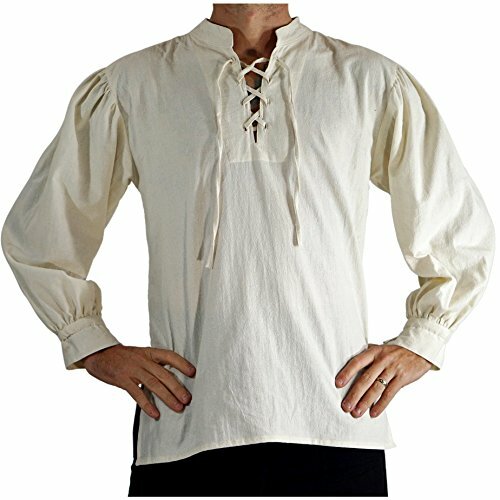 The shirts can be attributed to most eras of the Renaissance period. Amazing Quality at an Unbeatable price....Only at Zootzu! - Great for Pirates, Steampunks and Medieval Themes! - Baggy, super comfortable design! - Tied cuffs for an easy fit! Sizing Chart - Please note these are the shirts measurements and not yours! Please choose your normal size. You need lots of room within the shirt. XXS = Bust/Chest 35", Shoulder 15" , Back Height 26" XS - Bust/Chest 38", Shoulder 16" , Back Height 28" S - Bust/Chest 41", Shoulder 17" , Back Height 29" M - Bust/Chest 45", Shoulder 19", Back Height 30" L - Bust/Chest 48", Shoulder 20", Back Height 31" Xl - Bust/Chest 52", Shoulder 21", Back Height 33" 2xl - Bust/Chest 54", Shoulder 24", Back Height 34.5" 3xl - Bust/Chest 60", Shoulder 26", Back Height 36" 4xl - Bust/Chest 63", Shoulder 28", Back Height 38" 5xl - Bust/Chest 68", Shoulder 28", Back Height 38" Check your measurements. These shirts are meant to be roomy. These shirts are handmade and measurements vary slightly from stated. We recommend choosing your normal shirt size. SIZES ARE THE ACTUAL MEASUREMENTS - YOU NEED PLENTY OF ROOM WITHIN THE SHIRT! CHOOSE YOUR NORMAL SIZE OR ABOVE! From US Renaissance Festival seller 'zootzu' - +10 years at festivals across the US. Ties at cuff for easy sizing. An authentic fully wearable piece - not just for costumes! Great for Pirates, Steampunks and Medieval/Renaissance festivals and events! If you have any questions about this product by Zootzu, contact us by completing and submitting the form below. If you are looking for a specif part number, please include it with your message.